The Ackerly Green Book Club begins Monday, January 14, and our first book choices are The Monarch Papers Vols. 1 and 2! Starting next week, we will be covering 4-5 chapters per week and discussing themes, Easter Eggs, inspirations, lore, (our shared love of the Cagliostro) and more. All you need to do to participate is read the chapters for the week and join the discussion here on the forum! Each Sunday, a Guild Leader will post the theme and topics of the following week, with questions to initiate discussion. 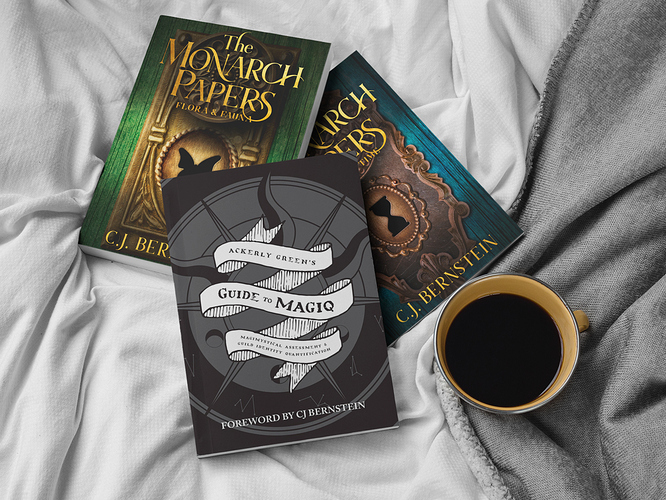 There will be periodic Hangouts with author CJ Bernstein, and a wrap-up week at the end of each volume. Everyone is welcome to share their insights, questions, theories, and memories! You can also look forward to random giveaways and Q&As with CJB, as if rampant internet speculation wasn’t awesome enough. Put on your tinfoil hats, Mountaineers, and join us. Yay! A time line and events! Are these happening at certain times? No. Each week is a full, open week of discussion of the questions and themes of the week, along with a simple (optional) creative project. The only thing that is scheduled is the Q&A sessions, and the times for those will be finalized closer to the dates of. I’m so excited I could die!!! This book club had me rereading the first few chapters of Flora and Fauna on the bus into school today! It’s a pretty long ride, about an hour, and I had a few people leaning over and asking about it!